You Can Win "The Family" Prize Pack Including Ray Ban Sunglasses! This giveaway has ended. Thanks for playing! In the dark action comedy "The Family," a Mafia boss and his family are relocated to a sleepy town in France under the Witness Protection Program after snitching on the mob. Despite Agent Stansfield's (Tommy Lee Jones) best efforts to keep them in line, Fred Blake (Robert De Niro), his wife Maggie (Michelle Pfeiffer) and their children, Belle (Dianna Agron) and Warren (John D'Leo), can't help resorting to old habits by handling their problems the "family" way. "The Family" open this Friday, September 13. 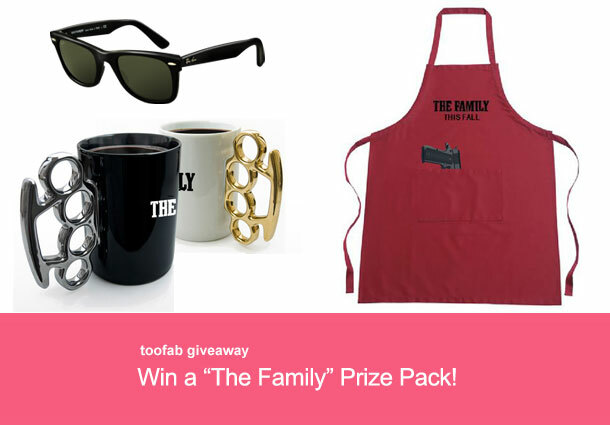 To celebrate the film's opening, toofab is giving one (1) lucky winner a prize pack including a pair of Ray Bay Sunglasses (essential whether you're in or out of the Witness Protection Program), a branded apron and brass knuckle mug. Simply fill out the entry form below for your chance to win! For more on "The Family," check out the official Facebook page and Twitter account. Michelle Pfeiffer Talks Acting Hiatus & Aging in Hollywood!